As forecasters warn of a bitterly cold and snowy winter, it was revealed that gritting lorries treated 67,000 miles of road to keep Surrey moving last winter. That is the equivalent of travelling from London to Sydney and back three times. With weather experts predicting that El Nino will create weather similar to that of 2009/2010’s big freeze, the fleet of hi-tech gritters is again set to hit the roads when temperatures plummet. Providing districts and boroughs with 40 tonnes of salt to spread in town centres. Surrey’s gritters, featuring location trackers and salt spreading monitors, will be supported by two mini spreaders to tackle hard-to-reach areas while Surrey 4×4 Response are standing by to help out if there is any heavy snow. Thermal maps of all Surrey’s gritting routes will show which roads are more at risk of icing up and 11 weather stations across the county will give updates on air and road temperature, rainfall and salt levels. 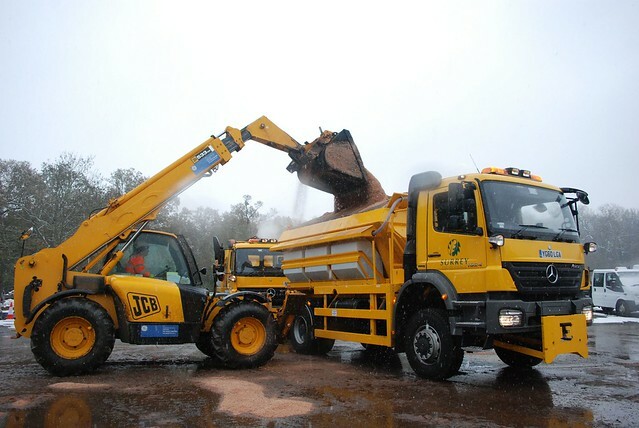 Surrey County Council’s Cabinet Member for Highways John Furey said: “Last year our gritters drove the equivalent of travelling between London and Sydney and back three times and they’ll be working around the clock again this winter to keep Surrey moving in any ice and snow.